Just before Christmas I read of a charity called uk4u-Thanks that was set up in 2005, to provide Christmas gift boxes as 'a gift from the nation' to all those serving in the forces overseas away from their families. It's mission statement is to deliver festive cheer to our forces risking their lives on our behalf at Christmas. In 2011, thanks entirely to generous donations from members of the public and our sponsors, uk4u Thanks! was able to send over 22,000 Christmas gift boxes to UK Armed Forces personnel on duty overseas or in hospital over the Christmas period. Boxes were sent to operational theatres such as Afghanistan, to ships, submarines and Air Stations across the globe. Each box contains about 20 items, although the actual contents are kept secret until the 25th December. All servicemen and women who are serving away at Christmas receive a box, whether they are in the Army, Navy or RAF, and wherever they are in the world. The Ministry of Defence has uk4u as one one of their preferred Christmas charities and are therefore happy support the Charity with advice and guidance on the number of boxes required and suggestions on the box contents. The MoD provide additional help sending the boxes out in any transport (not the BFPO system) going out to operational theatres which has spare capacity, doing so they avoid any potential to clog up the forces postal system delaying personal parcels from families and friends. The scheme recreates a similar project devised by Princess Mary, daughter of King George V, in 1914. The boxes, which are the same size as a standard ration pack, will be sent to troops using existing supply lines and transport. A spokeswoman for the Ministry of Defence (MoD) said: "What we're trying to do is demonstrate that the public is supporting our troops at Christmas." Princess Mary's idea in 1914 led to everyone serving abroad being given a brass box containing a pipe, a lighter, tobacco and cigarettes. In 2007 gifts included reading lights, flashing armbands for sports use, Christmas hats, playing cards, razors, tea-bags and games, all no doubt really appreciated welcomed by the troops. Each brass box had an embossed head of Princess Mary on the cover, flanked by the bows of battleships and roundels of the names of the Allies. Officers and men on active service afloat or at the front line received a box containing a combination of pipe, lighter, 1 oz of tobacco and twenty cigarettes in distinctive yellow monogrammed wrappers. "At a time when our Armed Forces are at their busiest for many years, I am delighted to have been invited to become the Patron to the Charity uk4u Thanks! Their aim, 'to deliver festive cheer' to all those deployed on operations at Christmas from all three Services, including regulars and reservists, draws on the best traditions of our Country in supporting Servicemen and Servicewomen deployed away from home at such a special time of year. This scheme, resurrected from the 1914 initiative by Princess Mary in 2004, has proved to be a great success. The Charity encourages industry and individuals to sponsor the Christmas Box, or 'square Christmas stocking' as it has become known. Whilst the Ministry of Defence assists with expert advice and facilitates delivery, the Box is a gift from you, the grateful Nation, to say thank you for a job well done under trying and often dangerous circumstances, which, thankfully, the majority will never have to experience." Rightly or wrongly, whatever your views on the various international conflicts being addressed around the globe, remember too that the Army, Navy and RAF are also often actively involved in the aftermath of international emergency crisis such as taking out famine relief or helping to rescue people trapped in extreme situations. As a singular example the Royal Navy sent out ships to the Turks and Caicos Islands last year with emergency aid after they were hit by the 135mph Hurricane Ike, adding to a huge humanitarian crisis unfolding in the Caribbean. 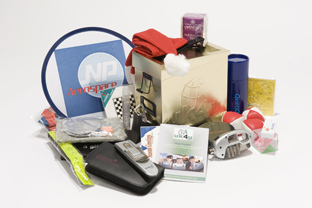 The image to the above is the contents of one of last year boxes, it is clear to see that they would be a welcomed gift to those who have received them. A recent e-mail also contained four small comments of gratitude which I have been given permission to reproduce them here. I feel really pleased knowing that serving personnel receive the boxes , a small gift at a time when they must surely welcome them. 1. I would just like to say thank you for my Christmas box this year. I am on Op OCULUS in Kosovo and this is my first time away from my family on x-mass day. I have to say i was really impressed with the quality of the gifts, and it made my day! I was sat on my bed like a little kid with all these little gifts all around me. THANK YOU VERY MUCH....! 2. Thank you so much for the box this Christmas! What an amazing idea, it's the first box I've received from your organisation and thought it was brilliant! I've served since 1982 as a junior apprentice at Chepstow, a regular soldier and also as a member of the TA. 3. Best wishes for the new year from all currently serving on Telic! 4. I just wanted to say THANK YOU! I was a lucky civilian recipient of a Box this year (Op Telic). I'm normally a bit apathetic regarding Xmas and presents, but was really thrilled to receive the box and open each item inside - it was like being a kid again! There are many charities, good causes worthy of our support, however I feel this charity stands out as being especially deserving of your support! Please spare a thought for all service personnel who deserve some welcome relief at Christmas. The charity has its own dedicated website with far more information and ways of how you too can help support this worthy cause, simply follow the link below. 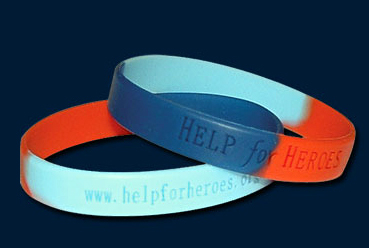 I feel that I should also add a link to the "Help For Heroes" website as it yet another way you could help out our service personnel. The ongoing Iraq offensive costs us causalities and as well as those killed there are many more injured. The MoD do what they think is necessary but I would imagine that the injured don't get what they ultimately deserve. 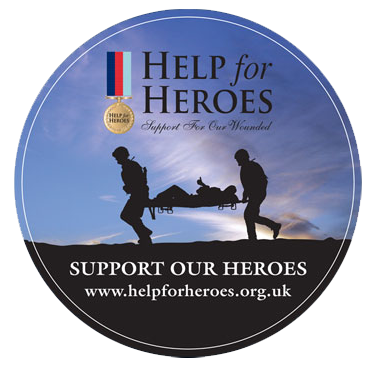 The photograph below has a link to the main home page for the Help Fro Heroes campaign which is full of information and ways you can help a worthy charity. If you would like to obtain some of the merchandise for the campaign follow the photograph link below. Please have a look at the S. O. S. page which is a new addition to this website sharing the same hope that you might feel encouraged to support for our armed forces personnel.